AT KARA’S URBAN DAY SPA WE ARE COMMITTED TO OFFERING SERVICES THAT ENHANCE THE QUALITY OF LIFE. WE BLEND FRIENDLY SMILES WITH AN EDUCATED AND PROFESSIONAL STAFF TO GUARANTEE YOU WILL FEEL REJUVENATED AND RENEWED. 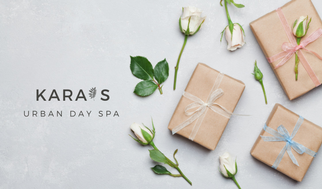 KARA’S URBAN DAY SPA IS IDEAL FOR GROUPS, WHETHER YOU ARE THINKING OF A GIRLS’ NIGHT OUT, BIRTHDAY PARTY, COMPANY OUTING OR A BRIDAL PARTY. OUR STAFF WILL WORK WITH YOU TO MAKE YOUR DAY PERFECT. WE CAN ARRANGE A CUSTOM DAY OF RELAXATION FOR YOU AND YOUR GUESTS. AFTER A GREAT DAY AT KARA’S ENTER THE WORLD AGAIN WITH A GREAT LOOK, FANTASTIC STYLE AND RECHARGED ENERGY! Check out Our Spa Packages!!!! Prefect for Parties and clients that want to Relax & Enjoy a beer or glass of wine. Kara’s offer Free Consultation! Why not schedule your Consultation today! Download our Full Service menu for all locations. © 2019 Kara's Urban Day Spa. All rights reserved.